The color pink has taken on a whole new meaning for me these last few weeks after finding out about the arrival of our little GIRL this August. And this delicate shade of pink is one of my favorites. 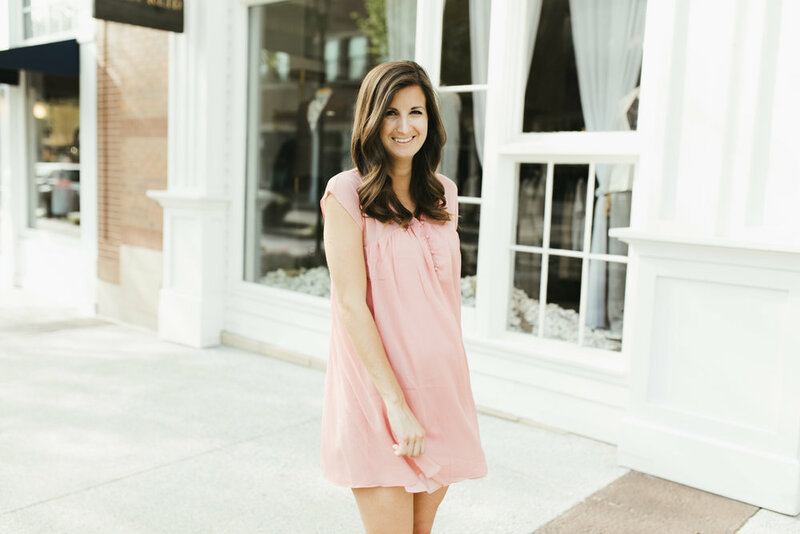 I've teamed up with Tobi to share this adorable babydoll dress with you. This dress will be worn as long as my belly can handle it. But the shade of pink is truly my favorite part of the look. Speaking of shades of pink, we've all heard the phrase, "just peachy." It's something we might use to describe our current feeling or situation. For the most part these days, life has been just that. Peachy. And I'm thankful. I was recently talking with a friend, who I consider a mentor for this whole "life advice" thing. She has an amazing gift of explaining things like His plan and His love so eloquently. In these conversations, I'm often reminded how He holds us in the palm of His hand. And this particular conversation involved our relationship with Jesus. Your relationship with the Lord is something you always have to work on. And when I say work, I mean always talking to him, which can be hard no matter what life looks like right now. When life is good, it's easy to forget to give thanks to God for those happy moments. When life is hard, it's easy to forget to turn to Him for help in the healing process. But no matter where we are in our day-to-day feelings, we have to keep a constant conversation with Him. Thanking Him, asking Him, needing Him each and every day. So, if life is peachy, pink, full of rainbows or shades of blue, I pray you remember to turn to Him for moments big, small and somewhere in between. He is always there and ready to grow with you.